Apologies for taking so long to get this post up; it's not like there's anything revelatory in the match report segment to make it worth the wait, and not much for laughs either. The good times seem so long ago now that it's hard to believe that they were still going relatively strong late last year. Fast forward to now, and while it's still early in the season, we've already reached one of the least appealing markers on the road to being crap, namely, being beaten by the "little" Greek clubs whose supporters (whether full-time or just there for the day) then decide to try and rub it in our faces. Several winning seasons may not have made us any more likable in the eyes of those people, it may not have even made them respect us, but winning at least gave us that psychological boost to the ego of "who cares what those people think?" Still, that's what you get for caring. Another less noticeable sign of our increasing decrepitude came later, when the SMFC TV video came out. I clicked ahead to the end, and sure enough, there were no post-match interviews with a coach or player. Maybe they were all too distraught with the last minute loss to speak to camera. Maybe no one could be bothered to interview them. Now I'm not expecting to glean clues to explain our poor start to the season, but it's nice to see someone front up even if it's just to spout clichés. I mean, the players do the best they can on any given day, and sometimes their best is nowhere near their actual best. Nevertheless, someone is responsible for what's going on out there at the moment, and while the players and coaches have to take their share of responsibility, as yet the supporters haven't turned on them. No doubt this is because their anger is being turned squarely at those who have decided, for reasons which may yet be valid but which only they know, to set us on this course. They must have figured that whatever it was that Chris Taylor had done, it was serious enough to turf him out just weeks before the season started, after having scrambled to sign enough players to fill out a first eleven, and letting other reasonable calibre recruits go to rival teams so late in the pre-season that one has to wonder at the planning process which lead to such a situation. Pity that this first eleven, which would've been covered by a degree of depth last year, is withering away on and off the field. To our on field struggles, lack of a Plan B, or even ability to run out a game, we've now got players sitting on the bench who are injured and unlikely to take part; why else would Leigh Minopoulos, who the previous week set up a goal and scored one himself, not come on even for the sake of fresh legs? Thus you get the strange situation of going down to ten men for the last twenty odd minutes and making just the one sub because that's all you can really do. One of the more naturally pessimistic supporters said that season 2018 feels like season 2008, and to be honest, at this point it's not that far off the mark. Each week a little bit of hope is chipped away. Can't defend. Can't run out games. Can't hold a lead. Treading water until the mid-season transfer window opens up in several weeks. But we've got to keep supporting the team through thick and thin, it's just what we do, and goodness knows the boys need all the support they can get at the moment. Maybe an unlikely cup win can spark something? 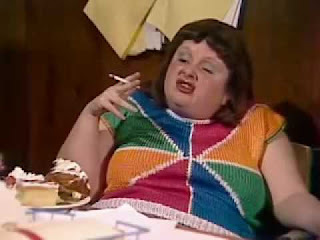 Look at me clutching at straws. See everyone on Friday, unless they've got you working the night shift. Hume City away in the FFA Cup, on the Good Friday public holiday. The match will be streamed by FFV. Northcote has changed its point of entry to the gate back of the venue on Clarendon Street. Northcote is also the latest club to move towards night (or at least this stage, twilight games), although they haven't yet bitten the bullet (or received the necessary approval) to go to Friday nights like everyone else. The candy bar in the social club is also gone, so if you're in the mood for Skittlebrau at John Cain Memorial Park, you're going to have to bring your own Skittles from now on. There's also action going on in the western part of the ground with the hill behind that goal dug up, and where the small secondary pitch was there is now a massive hole in the ground which some people were speculating was for car parking for apartments, but is in all likelihood a "proposed underground water storage facility", which will likely include the reinstatement of the "full size senior football pitch to west of existing NCFC stadium pitch." The priority for FFV is to relocated the administrative base back to John Cain Memorial Reserve. Which will of course have people flailing their arms in bewilderment. So it goes. And as if there weren't enough disclaimers in the segment title, here are some more. Each year's quality of youth players is going to vary, even if that's not the point of the NPL. It could've been an off day for every player from both teams. It's Australia and we still have to be if not forgiving, then at least tolerant and expectant that the skill level won't be world class. Like everyone else, the kids are trying to do the best they can. Making sense of a game from up in the stand is much easier than making sense of it at ground level. And as always, my soccer opinions should always be taken with a large grain of salt. But this is what got me unexpectedly flustered, because I usually invest very little emotionally into youth soccer, knowing that the results only really matter if you're at the top of the table at the end of season, and that most of the players will end up being nowhere near the standard of the state's top tier when they finish youth football. It was the on field decision making that dare I say it, actually upset me. The skill level wasn't great in last Saturday's 20s game, but there were so many bizarre decisions made that I feel like it's worth highlighting two of them to show what I mean. The first moment actually involved a well executed piece of skill, which lead to an absolutely dead end situation. It was a cross-field diagonal ball, perfectly placed from the left wing to a player running towards the right hand corner post. And the brilliance of that pass masked the fact that the receiving player had nowhere to go, and no one to pass to. The best that could realistically be achieved in that situation is a corner, because it's unlikely that the player is going to be beat one, let alone two defenders in order to get into the box. The second example had much less going for it in either aesthetics or thoughtfulness. A high loose ball was heading toward a defending player somewhere between the centre circle and his own 18 yard box. There was ample time to control the ball, but instead he took a massive swing at the ball, missing it completely. As much as he looked a fool after his air-swing, what would have happened if he had connected with the ball? It would have gone flying up the other end of the field, turned over back to the opposition goalkeeper. My reaction to these and other confounding examples of poor decision making was, how did it come to this? And I know that writing it all out like this probably makes me come across as petty, and naive, and ignorant, and I'll wear that because it's not like I have any education or interest in youth football methodologies. I can't tell you who or what is to blame when things turn out awry; the best and only advice I can give any young soccer player is to go out and watch more state league games, preferably ones with some elevated viewing spots. But I say this in part because that's the κουτσό στραβό method I mostly rely on to learn about soccer. But I am intrigued now about how decision making is taught to young soccer players, and I am even prepared to be enlightened on the matter by those who know about such things. 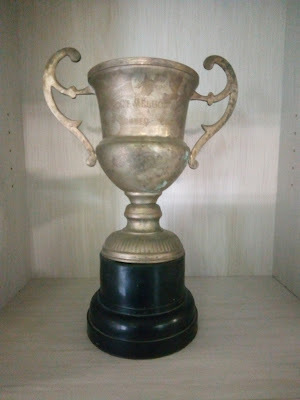 An old battered trophy, on a cheap plastic base. 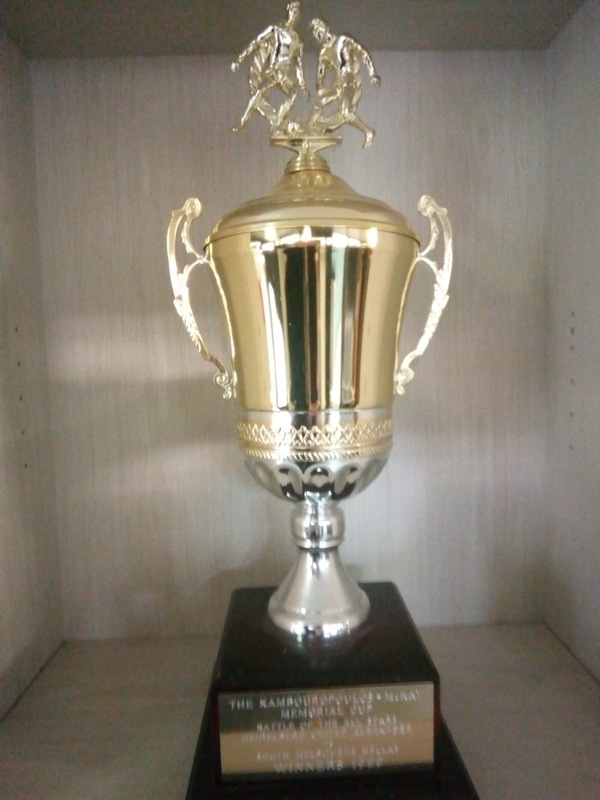 Summer Cup"; there is no date on the trophy. The other week I ventured out to Bundoora to visit La Trobe University's Greek archives, ostensibly to offer an extra hand to Tony Wilson and Rob Heath who are making that Ferenc Puskas documentary that I've mentioned here once or twice. 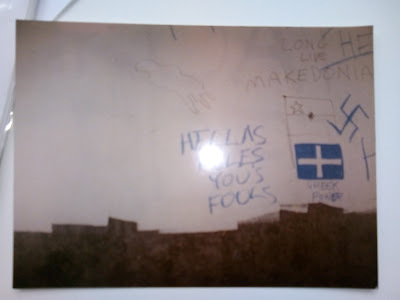 Of course, as well as hopefully being of use to Tony and Rob as they looked for relevant materials, one of the other benefits of visiting the archives was to see what South Melbourne Hellas stuff they had more broadly. The results of that secondary goal were a mixed bag. But first to the archives themselves. Located on the southern fringe of La Trobe's Bundoora campus, the archives are located in a former high school site, almost invisible to the general public. To be fair, almost any kind of archive held at a university is invisible to the general public, who more often than not don't know that these kinds of archives exist, and that they can be accessed by the public. Though who knows whether such contact information is even current. Hate the FFV website? Try navigating a university website looking for current and correct information after they go through countless updates and tweaks to their interface. Anyway, from my place in Sunshine, it takes a good hour and forty-five minutes to get to the archives by public transport. Luckily on that day I got a lift to Sunshine station, and a late route 350 bus meant that I didn't have to wait an extra 15 minutes for a later bus. The bus winds its way through the inner north, goes up the freeway, than meanders through Ivanhoe and suburbs like that. It stops at the corner of the old high school, which is convenient enough. The first thing you notice when arriving is the Melbourne City (Heart, not the Argentines) branding on the buildings. It is of course where their Melbourne headquarters/colonial outpost is situated. I got there a bit early, so ended up loitering outside in the rain as Heart players and personnel I didn't recognise filed inside, until I was eventually visited by an office staffer asking me what I was doing. I could've provided any number of sarcastic answers, but settled for the truth, that I was waiting for people so we could visit the archives. Then she directed me to a completely wrong area. These things happen. Tony and Rob having arrived we get ushered in by Michael, our guide for the day, through a side gate. What follows is a few hours of searching through boxes and plastic sleeves, interspersed with a potted history of Greek life in Melbourne, Victoria, and occasionally places further afield. Michael shows us the film room, filled with posters and film reels of the golden age of Greek cinema, the history of such being one of his specialties. South Melbourne social club's museum space. As is often the case, there are grievances aired about university funding and resource priorities. With similar issues coning up across the university sector, I feel like I could contribute a lot to this conversation, but decide to let it unfold as a monologue. Tenured scholars, archivists, librarians, post-graduate students; we all know the issues intimately, especially as they relate to the humanities, and the temptation is always to join in and vent. But sometimes you've just got to sit back and listen. The archives are in if not quite what one would call a chaotic state, they are nevertheless not in their optimal catalogued state. Many boxes exist, the items contained in those boxes usually correspond to the box's chief designation, but items within the box are more often than tagged with a reference number and not much else. There is hope that one day a thorough and proper cataloging of items will takes place, but that will take several years, and the persistence of those who care about the archives. Looking at the troubled history of these archives, there's no guarantee that the quality of their itemisation and preservation will improve. But we can always hope! 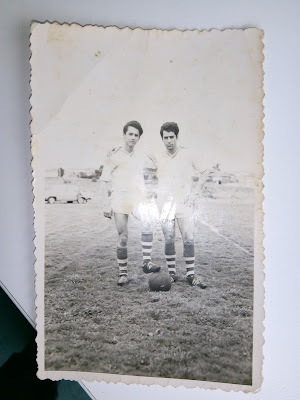 Anyway, as part of their research for the film, Tony and Rob were looking for photos of Ferenc Puskas in Australia; moving out to images of South Melbourne Hellas from that era; moving out further again to images from South Melbourne Hellas history; and most broadly of all, images from Greek life from the 1950s to early 1990s. On that last front, there are a lot of photos to sort through, of social and regional brotherhood club clubs, of soccer clubs, picnics, church and festival days. Some photos are marked on the back, noting the event, the date, the location, but most are blank, its subjects anonymous. Over time, the people involved will become only more obscure. Sorting through the boxes was a ramshackle affair, and yet also soothing in the way familiar to researchers both lay and professional. You get into a zone where the eclecticism of a collection becomes its own reward, and you get distracted by the breadth of materials on offer. So while I was there primarily for the task of finding materials relevant to the documentary, I could not help but go down detours, and to that end I found all sorts of photos and objects worth noting, including things you want to check out later on; in my case, the collection of Athletic Echo, Athletic News, and Athletic Flame Greek-Australian sports newspapers are likely to have all sorts of interesting information (and doesn't this stuff just need the most urgent digitisation!). photo: all of that remains a mystery. But there are of course problems with accessing archive collections such as these, and chief among those is the ever present spectre of copyright. In cases where stuff is old enough (say, prior to about 1954) things are pretty clear cut, but later on it all gets tricky. Who owns it? Under what circumstances can I or someone else (re)-distribute images of materials included in the archives? And is it possible that if I put up photos of photos into the public domain, that another researcher will have tighter restrictions placed upon them? That's why I've been careful here not to reproduce too much. 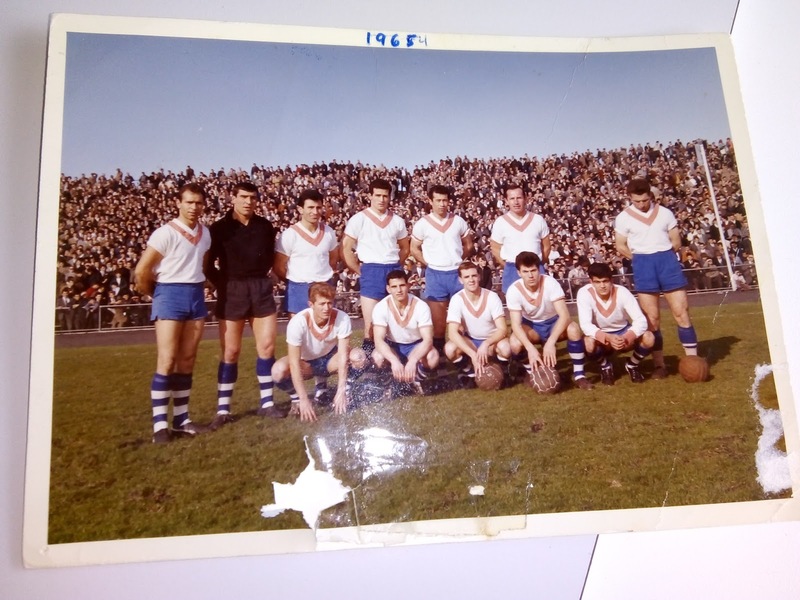 The South Melbourne Hellas "Red Vee" photo? I've put it up here because versions of the image are already out in the public domain. The trophies? They aren't photos, and ownership of their copyright quite clearly belongs to no one. The graffiti photo? So obscure that it's unlikely anyone will ever come calling to claim ownership of it. The Northcote photo (see right) of two unknown players, of unknown provenance, seems like the kind of thing that could safely be reproduced by again, the laws around these things are often murky. It's one of the problems that Rob and Tony are going to have to deal with in making their documentary. The photos they found in the archive and which they may want to use were created by someone, and unless those people have relinquished copyright, they'll still have intellectual and moral ownership of the items. Similar issues come up in using different archives, including soccer collections like the Laurie Schwab and Les Shorrock collection at Deakin University. There are loopholes, considerations around fair use and honest attempts at finding out who owns the rights ti particular materials, but this is one of the reasons why Tony, Rob and I want the South Melbourne Hellas community to dig into its own attics, basements, cupboards and drawers to see what material it has, so Tony and Rob can get access to material which not only has a sense of cultural authenticity, because it was produced by non-journalists, but also because the ownership rights of such material will be much easier to trace. And that's why I'm a bit dumbfounded that the club hasn't put up anything yet promoting Tony and Rob's search for these kind of materials. The club's Facebook page has nearly 60,000 followers, and the club has 13,000 followers on Twitter. As far as social media goes, I have a reach of 60 people on Facebook (I barely use it), fewer than 1,000 followers on Twitter, and this blog which is read by the same old 300-400 people unless there's someone jumping a fence to attack someone else. Even if a good deal of the club's official social media followers are fakes, its reach would still be way bigger than anything I could muster. And in case anyone is wondering, yes I have forwarded on stuff about the call for homemade South Melbourne Hellas materials to the club to use and adapt as they see fit (and if they don't like that, they can even write their own stuff), and I've received no response. The lack of any promotion of the documentary and its call for footage and photos is especially weird because the club is aware of what Tony and Rob are doing, and Tony and Rob actually got an invite to the club's jersey night the other week, where I assume things went well. 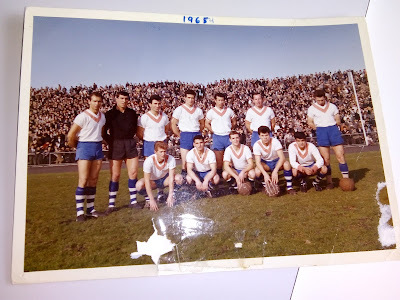 The club would even benefit from whatever film and photography gets unearthed by the call out because first, it will make a better documentary about South Melbourne Hellas, and second, because the club will probably get access to a whole bunch of material it didn't have before. Folk from a range of former NSL clubs who have tried to get match footage from the any of the networks, and SBS especially, have come up against the problem that it costs a hell of a lot of money to get access to that footage. As much as it annoys me, I understand why this is the case, even if I can see little scope for any of these networks ever making money from NSL footage. Apart from oddballs with acute historical connections to the relevant clubs, the only use for that footage is television networks looking for easy access for soccer riots - and even then, they've got most that stuff on speed dial. But televised soccer history isn't just the games, it's also the news segments, the off-field pieces, the humorous segments. While NSL matches may have (as far as we know, and only after certain dates) largely survived the "we need space" culls of network television archives, it came to my attention that other elements of our soccer culture have been taped over to create space. That this has been done by SBS is disturbing on several levels. First, SBS is a public broadcaster, whose remit goes beyond whatever short termism may exist at the commercial networks. Second, SBS is (or at least was) the self-proclaimed home of Australian soccer. Third, SBS was the network most closely associated with migrant - that is non Anglo-Celtic Australia. All these things make SBS' erasure of our history something to be despondent about, but what's done is done and there's not much that any of can do about it. Except, of course, those who have (probably) broken the law in the past to record television programming onto VHS tapes despite the ubiquitous copyright warning notices, and who have then gone one step further to definitely breaching copyright by uploading those materials to online platforms without getting any permission to do so. As far as Australian soccer goes, these people have inadvertently saved otherwise impossible to find moments of our soccer history. But here's the catch. If you want to use those videos in a commercial production - videos containing footage which no longer exists in any other format because of its destruction by the original broadcaster - they can still charge you for using that footage! When I heard this, I was dumbstruck. I mean, by erasing their footage, haven't the broadcasters forfeited the right to charge if not legally, then certainly morally? It's a mad world, to be sure. The good thing is that the interviews for the Puskas doco have been going well, and that most of the people you'd expect to be called upon to give their version of events have done so. No spoilers though! Thanks to the visit to the archives, I managed to get copies of several home match programs from 1988 to add to the collection. As is increasingly the case in Melbourne nowadays, there are more Friday night soccer options than you can poke a stick at, as clubs strive to get some of those sweet TGIF metrics, though the jury's still out on whether Friday night games make any difference in the long run. It's not like we have anything more than anecdotal evidence to go on, since almost no club posts attendance figures anyway. Given the choice of five NPL 1 matches, most of them within reasonable reach even for me, I decided to head to the round 1 State League 1 South-East contest between Richmond and Beaumaris instead. It was a mini late South Melbourne NSL reunion of sorts, with Richmond being coached by Sam Poutakidis, and Beaumaris by Marcus Stergiopoulos. The reunion didn't extend to Kristian Sarkies, who was unavailable for Beaumaris because he was in Hawaii. It was also an informal reunion for several people associated with Richmond's brief golden era, the circa 2010 period where the club finished minor premiers and grand final runners up, with the then coach (Mike Chatzitifronas, his first soccer game in several years), team manager (Mark Boric), president (Helmut Kalitzki) and a few others reminiscing and asking where some of the old players had ended up. To be honest, my main interest in this match lay in its prurient qualities. Richmond is in the unenviable position of being the first club to have been relegated from Victoria's NPL system (Bendigo City were also relegated, but they disbanded their senior team soon afterwards, as was expected). So what happens to a club in that position and how do they rebuild? And what does rebuild mean? To answer that last question, Richmond's goal is to get back into the NPL, and to do so as quickly as possible. That much was clear from the visa player heavy squad which took the field. of a fire several years ago and because what remained was being restored. Elsewhere, one had to look for clues in the way match day was being run, while being careful not to jump to doomsday conclusions. Entry was free, but that could have been a sign of goodwill for the first game of a 65th anniversary season. There was no memorabilia on display, but that was because it had been packed away for restoration and a hope for improved display in the social club. The crowd was small, but it was still bigger than most comparable affairs last year. according to those in the know. Even the canteen, which somehow ran out of bread rolls and was cooking nearly everything to order - even the bain marie staples - was apparently running along the same lines as last year. More concerning is how does an NPL club's culture regenerate or persist when it is no longer an NPL club? Eavesdropping in on conversations over the course of the night, it appears as if most of the juniors which had played NPL with Richmond had moved onto other NPL teams. The introduction of the NPL itself, with its rigid junior squad frameworks, means that there are a lot of people at NPL clubs (youth players and parents alike) who are there only because of the fact that they club in question is an NPL club. Now to be fair, this was a trend that was in evidence before the establishment of the NPL, but the NPL has solidified it - nearly everyone's presence at an NPL club is strictly conditional upon the club remaining an NPL club. Just as concerning, is that in order to become or re-become an NPL club, the juniors you've accumulated along the way will have to largely be discarded. As long as there's enough of the strange few who remain attached to senior men's football in a spectator or supporter capacity, there's a cultural bulwark in place to make sure those kinds of clubs can remain as such. 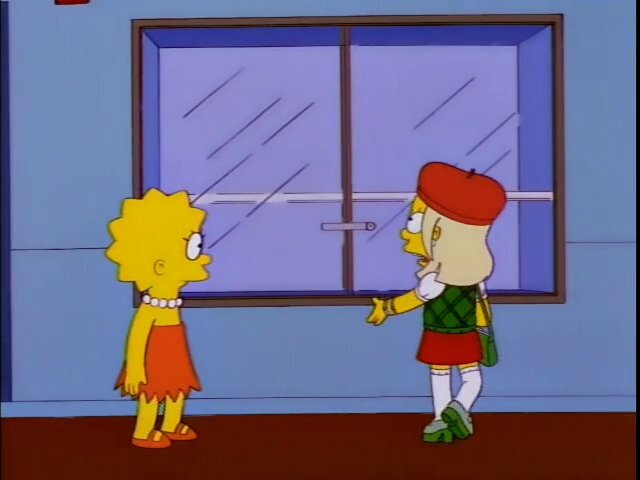 But what happens when that cultural foundation is discarded, or wears away? What will the NPL clubs whose senior football reason for being becomes obsolete or discarded? Bendigo was always going to fall away, because there was no shared history for anyone to really care about. But if you think that some of the once upon a time stalwart clubs are going to be able to fare much better in the next ten years or so as interest in senior second tier men's wanes, then you are a much bigger optimist than I could ever hope to be. Looking towards the bottom of both NPL2 divisions at the moment, and there's at least one candidate that I can see struggling to recover should it fall out of the NPL system. Richmond themselves were not so far away from that fate last year, with a large tax debt and relegation seeing the then custodians of the club prefer to pull the plug than fight it out, letting a long if not altogether storied history go by the wayside. They got lucky: they got a benefactor of sorts to pull them back from the ledge, restoring a sense of equilibrium. But as we should all know by now, regardless of the success they may bring, benefactors are a poor substitute for a strong supporter culture in terms of holding clubs together. Always look forward to your weekly views and thoughts on the week that was. With the coach facing an uphill battle to field a starting 11, our chances of beating Hume start to become less likely. A loss on Friday would see the club enter crisis mode. A coach under fire for poor performances, a playing squad's abilities doubted, and a Board facing renewed calls to admit their decision to sack CT was a huge mistake. Continued poor run of results would see the club's focus turn away from that of winning a championship to simply surviving and avoiding relegation. If the above doom and gloom plays out over the next 2 months, the end of the 2018 season cannot come soon enough. It isn't right that Richmond had to discard most of their players at all age levels upon being relegated. -This can't be good for the player development system in Australia. Pretty sure that graffiti reads HELLAS RULES YOU'S FOOLS. Possibly the most Melbourne-Greek thing I've ever seen. How embarrassment! Well spotted, caption fixed now. If we are fixing things can I please get my name restored? Woops, went all Mike Jedinak there. Brilliant post Paul. First full blog post of yours I've sat down to read for a while. The South situation is worrying, the Richmond situation is a warning. It's these bread and butter problems that put flashier exercises like A-League expansion and Second divisions into perspective. The suffering endured by passionate fans and communities who fight against an impossibly unforgiving culture that rewards flashing lights and loud noises. Next to, or concurrently with, or independently of - however you want to put it - the AAFC's desire for what I've called a "necessary realignment" of the Australian soccer league system, is this other cultural realignment already taking place. Do people, especially current and future soccer generations, actually want to be connected to second tier senior men's football of any code? The SMFC Board sold us a dream for the new season and we were given a nightmare. For the first time this century, they haven't sold me a membership. I also should've noted that Jake Marshall played a half and a bit in the 20s last week, so hopefully in line for senior consideration sooner rather than later.